NEW YORK—New York City is home to the largest public school system in the nation, and Mayor Michael Bloomberg has made significant progress in reforming the system during his three terms in office. Graduation rates and test scores are up, but several issues loom as mayoral candidates compete for parent and teacher votes. 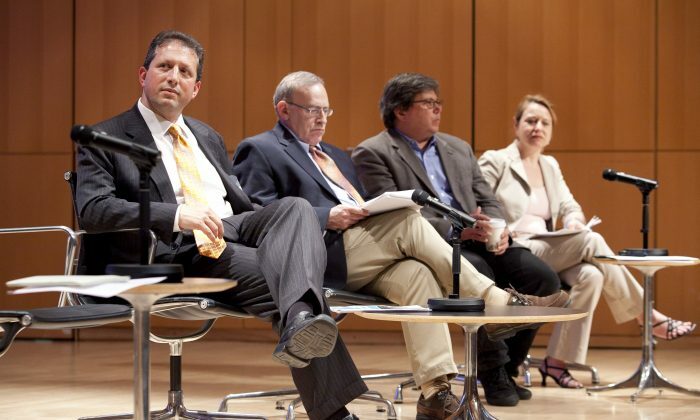 Council member Brad Lander, and John Mollenkopf, a professor of political science and sociology at the Graduate Center of the City University of New York (CUNY), discussed their working paper at CUNY on May 10. The paper is the opening chapter in a collection titled “Toward a 21st Century City for All,” that articulates a progressive agenda for the city. Pallas said that graduation rates have increased sharply in New York City during the Bloomberg administration. “But this is not necessarily demonstrating that students are ready for life after high school,” said Pallas. Pallas presented research showing that graduation rates are not telling the entire story on the performance of the city’s public schools. The percentage of students who are college-ready is drastically lower than the percentage of students who graduate from high school, according to Pallas. Black and Latino students perform significantly lower on state tests than white and Asian students. Pallas presented slides at the panel showing that achievement gaps exist not only in terms of race: students with disabilities as well as English language learners are also performing worse than the systemwide average. When this year’s scores on standardized tests are released in August and July, parents and students can expect sharply lower scores than those in previous years, Pallas said. New York state adopted the Common Core Curriculum last year and the first common core tests were recently conducted. So far only Kentucky has tested students using the new Common Core standards and the results were much lower than with other standardized tests. Pallas took the results from Kentucky and applied them to New York City to make a projection for the results this year. He expects proficiency levels to fall almost threefold citywide, setting the tone for the 2013–2014 school year. Pallas characterizes the Bloomberg administration’s education strategy as that of “the invisible hand,” one where schools stay open only if they meet the standard, and close if they continue to fail. Pallas prefers the “helping hand” strategy to the invisible hand. He suggested that the school system should focus on improving its teachers and other staff, thus elevating the quality of the system as a whole.